Can You Save Capital Gains Tax By Reinvesting In Property? Can You Save Capital Gains Tax By Reinvesting In Property? Can you avoid capital gains tax in Australia by reinvesting in another property within a certain time frame? The answer is almost certainly not. Here’s why. Hey guys this is Ryan from onproperty, your daily dose of property education and inspiration and this week I’m answering your questions, the ones that you have emailed me and today we’re talking about avoiding capital gains tax after you’ve sold your property. If you purchase another property within a certain amount of time, can you avoid capital gains tax? Well the answer to this question Deval is that from my knowledge you can’t actually save capital gains tax by reinvesting it in another property. Now although you may have read “Rich dad, poor dad” or a bunch of the Robert Kiyosaki books and while he does advocate reinvesting in order to save capital gains tax, that’s in America and as far as I’m aware there’s a clause in America which says if you invest within a certain period of time you roll over the capital gains and so you don’t pay the tax on it until eventually you sell that property down the track. But I’m not a tax accountant but as far as I’m aware that clause doesn’t exist in Australia. So if you’re selling a property then you’re going to be paying capital gains tax on it and there’s no rollover available to be able to move it into another investment property. In this situation with the property valued at $400,000 and a $305,000 loan on it, in order to get an equity loan from the looks of it you can probably only access about $15,000 if you decided not to sell the property instead wanted to get an equity loan you could also look, you need to talk to your mortgage broker but look at rather than selling the property, if you’re keen to invest and the numbers stack up and everything works for you, you may actually be able to get a larger equity loan on your property up to a 90% loan to value ratio or even 95% loan to value ratio. You will have to pay lenders mortgage insurance on this borrowing but it then allows you to go forth and invest in another property and not sell this property, well that may work out for you. Deval I don’t know your situation, I don’t know if your definitely 100% going to sell, I don’t know if this property as peaked and it’s not worth keeping but that would be definitely something I would consider. Go and speak to your mortgage broker if you don’t have one, my mortgage broker can give you a call, go to onproperty.com.au/mortgage enter your name and number and they could give you a call there. 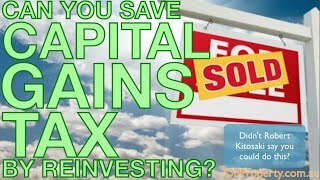 But basically I’m afraid that the chances of you minimizing or getting rid of capital gains tax by reinvesting just isn’t a possibility but I would always speak to a tax accountant, I am unable to give tax advice, this is just my knowledge of the situation when it comes to capital gains tax. So it shouldn’t be considered as personal taxation or financial advice. I’m just covering myself there but I hope that this has helped you and gave you some clarity on the matter. If you have any questions that you want answered and I a guaranteeing people that I will answer any question that gets asked go to onproperty.com.au/contact or email me ryan@onproperty.com.au and if you want the full transcript of today’s episode that’s at onproperty.com.au/208 because we are up to episode 208. So until tomorrow remember that your long term success is only achieved one day at a time.